This book examines representational fairness in WTO rule-making. The context of examination is the pharmaceutical-related provisions of the TRIPS Agreement and the interests of developing countries and pharmaceutical multinational enterprises therein. 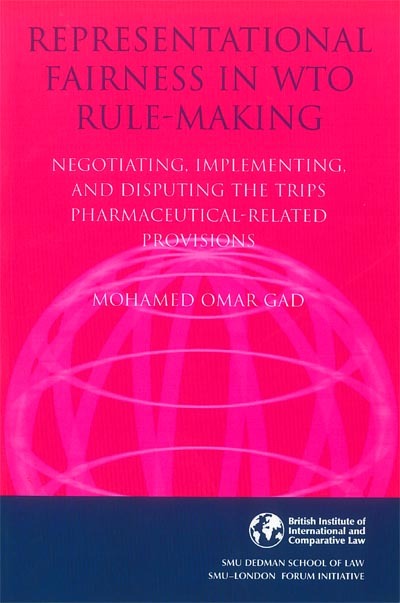 The book analyses the negotiation and implementation periods of the specified TRIPS provisions and the legal disputes that arose, covering the period from the mid-1980s, until the adoption of the Doha Declaration on the TRIPS Agreement and Public Health in November 2001. An imbalance reflected in the negotiated text in favour of pharmaceutical MNEs' interests during the negotiation process is characterized as 'top-down' rule-making. Reacting to this, developing countries exerted pressure from the 'bottom up' hindering the implementation of these TRIPS provisions. This retorting action, while instilling a degree of balance, congests the TRIPS regime and the larger WTO system with additional dispute proceedings leading to strains in North-South relations. The volume concludes with selective suggestions focusing on the rule making process of the WTO and proposes measures to reduce the likelihood of a deficiency in representational fairness occurring in future negotiations. The full price for this book when not purchased via the website is: Members £57 Non-Members £95. "Representational Fairness in WTO Rule-making"